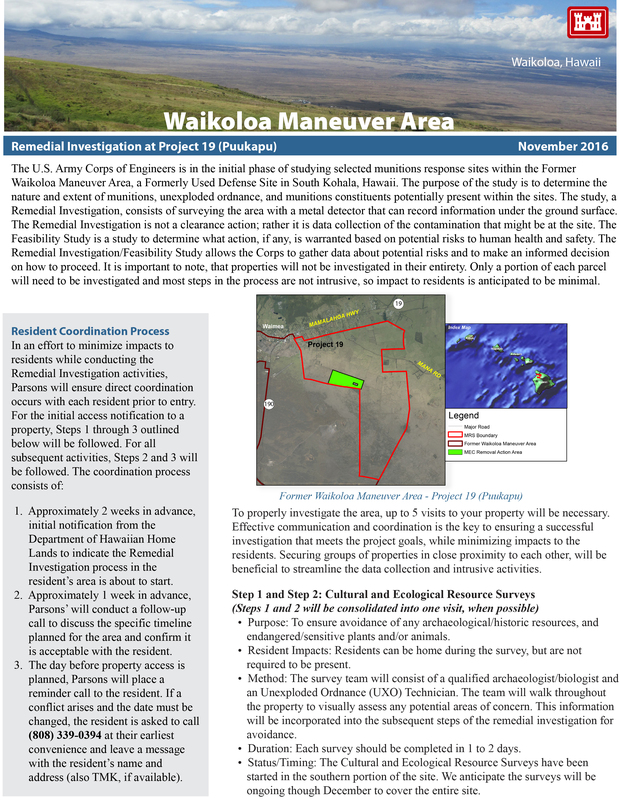 The Department of Hawaiian Home Lands is working with the U.S. Army Corps of Engineers (USACE) to identify all Trust lands affected with UXO. Right now, we know that Trust Lands in the former Waikoloa Maneuver Area (WMA) include Puʻukapu; Kūhiō Village; Lālāmilo; and four lots in Kawaihae ma kai. Lands in Makuʻu Farm Lots were the former target site known as Popoki Target Area. Both areas were utilized by the U.S. Military during World War II. Trust lands in the former WMA are currently being investigated by the USACE along with their civilian prime contractor, Parsons. For more information on the unexploded ordnance (UXO) property investigation process please click here: UXO Property Investigation Process. **If you do not know the TMK for your homestead lot, visit the Hawaiʻi County TMK website.